Simpson (June 16, 1902 - October 6, 1984) is known for his contributions to evolutionary theory and to the understanding of intercontinental migrations of animal species in past geological times. 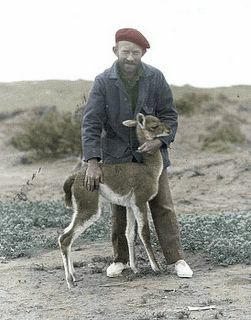 Simpson specialized in early fossil mammals, leading expeditions on four continents and discovering in 1953 the 50-million-year old fossil skulls of dawn horses in Colorado. Simpson helped develop the modern biological theory of evolution, drawing on paleontology, genetics, ecology, and natural selection to show that evolution occurs as a result of natural selection operating in response to shifting environmental conditions. He spent most of his career as a paleontologist at the American Museum of Natural History. image. From Today In Science History.